FINALLY! The much anticipated and amazing Rhubarb Cupcakes (which, sadly, did NOT win any prizes at the Sumner, Rhubarb-Days cook-off, probably because they were just so awesomely unique and original). Hey, we found out about the bake-off the night before and really wanted to enter, so had to work with what we had in our cupboards. Anyway, that said, here's the recipe. Preheat the oven. The box recommmends 350 for metal or glass pans, 325 for dark or coated pans. Put ONE CUP finely chopped rhubarb, 3 Tablespoons water and 3 Tablespoons sugar in a small saucepan, bring to a boil and remove from heat. Let sit a couple minutes and then drain well. Rhubarb bits should be tender but NOT mush. Set aside. Puree the TWO CUPS of coarsely-chopped rhubarb with water, cornstarch and oil (and food color if desired) in food processor bowl until as smooth as possible. 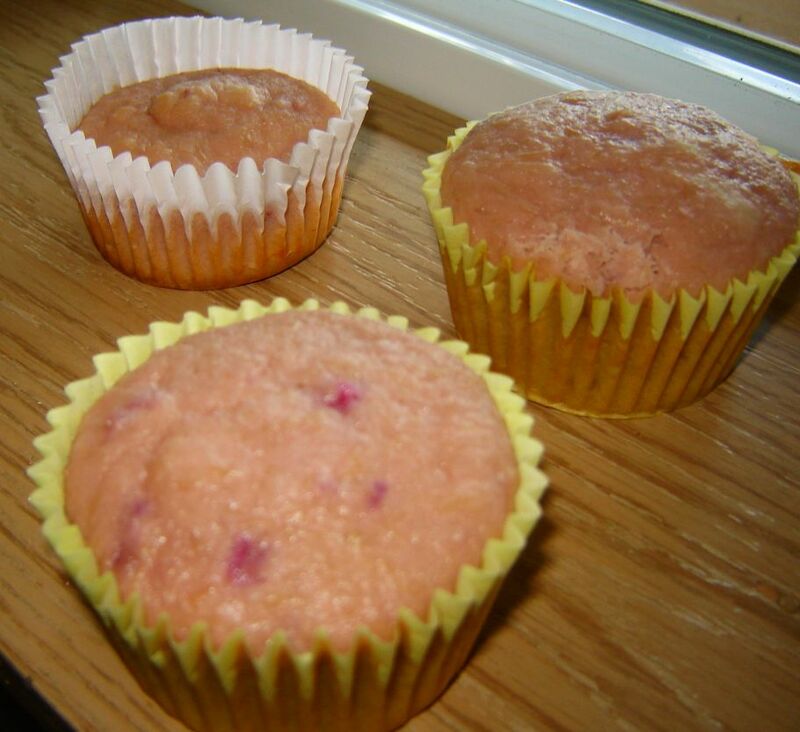 Add puree to cake mix and mix with electric mixer as directed on package (batter should be thick). Fold in bits of cooked rhubarb. Pour into prepared cupcake pans, filling a bit over 3/4 full, these don't rise a whole lot. Bake as directed on cake box, testing with toothpick for doneness. (They may need a minute or two more). Cream the 'butter' until fluffy, add lime juice and gradually beat in the powdered sugar until the mixture is very fluffy. Zest lime into frosting and stir. Frost cooled cupcakes. 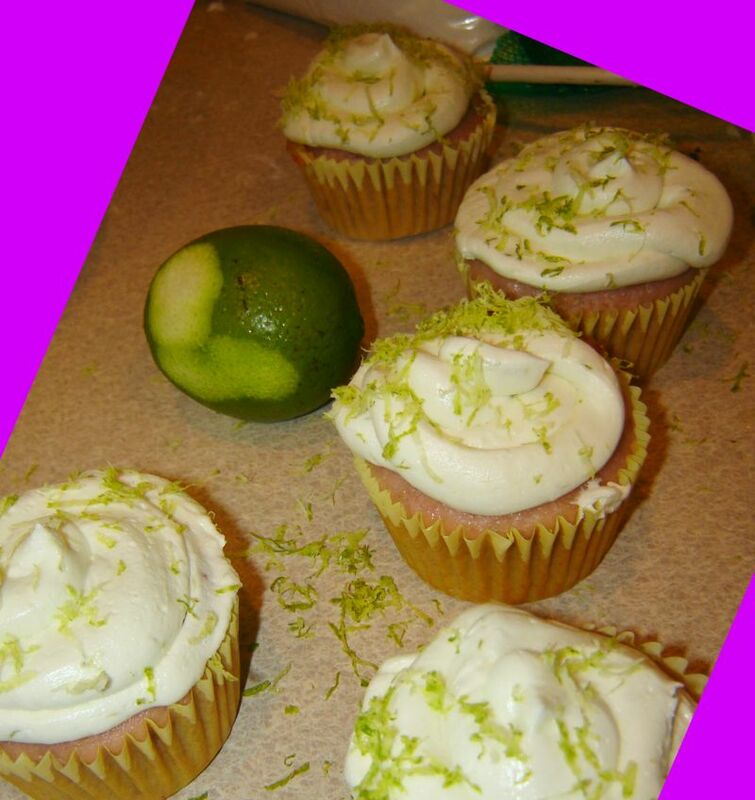 **Optional: Lime frosting is especially yummy if "infused" with an herbal undertone. If you'd like to go all Über-fancy , steep 2 Tablespoons chopped, fresh herb of your choice (sage, lemon grass, lemon thyme, purple basil) in 2 Tablespoons boiling water for 10 min. Like you're making tea... 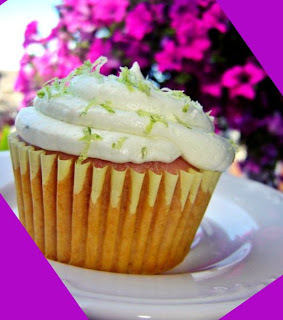 Drain and save liquid, discard leaves, cool and whip a teaspoon or two of liquid in the buttercream frosting, adding about 1/2 cup more powdered sugar to maintain spreadable consistency. Is red food coloring vegan? I thought it had carmean (or something like that) in it that is made from crushed up bugs. Not that I like bugs...in fact I actually murder the more disgusting ones but I still try not to eat them though I did eat one while running the other day....lol. I wondered if they had one that was vegan! Thanks for letting me know.